A well-known educationist in India, Ms. Chatterji, or Shubhra di, to all of us is our Director and Vice President. She has been a part of several missions and panels in India in the K-12 spectrum. Ms. Chatterji has also been invited by the MHRD to be a member of JRM on Teacher Education for Uttar Pradesh and Tripura, 2013 and a member of JRM, SSA for Nagaland, 2014. She has served as a member of the National Council for Teacher Education (NCTE) Delhi and NCTE, Eastern Region for 3 years and appointed as member of different Joint Review Missions set up by Government of India from time to time. She has worked as Consultant with Room to Read, Nepal to set up their Early Grade Reading Programme. She has also worked as Education Consultant for UNICEF, Kolkata for capacity building of teacher educators and academic supervisors in the government system on improved strategies for teacher training and teacher support. Presently, she is working with the state Government on several of its projects such as Education to Employability, Early Childhood Care and Education, Life Skills etc. She has supported the government to develop various curricula for its programmes. Her visions are our driving force and her sharp reviews keeps us all on our toes! Shubhra di is an avid reader and enjoys watching a variety of movies and documentaries. A student of English literature, Ananya started working as a teacher at the Heritage School. She enjoys spending time with children even when she is not teaching them. For Ananya, learning has not ended with her university days. She likes to explore new ways of teaching. As a teacher, she was accustomed to formal classroom teaching, as a part of Vikramshila she has learnt how children can be taught through a variety of methods including the using of technology in education. She is fond of singing and painting, skills that come handy when she includes musical activities in the class or prepares Teaching Learning Materials for the students. While she always wanted to be a teacher, working with Vikramshila has given her the scope of being a teacher with a difference. Here, teaching is not restricted to school or center, but spreads wider to reach other states and districts, and naturally, the task gets more challenging. But she strongly believes, 'happiness does not come from doing easy work but from the afterglow of satisfaction that comes after the achievement of a difficult task'. 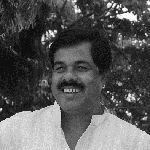 Mr. Atanu Sain has been working with Vikramshila since 1994. Travelling and interacting with diverse groups of people are his twin passions. He loves a good argument supported with logic and reasoning and the analysis of human behaviour is one of his core areas of interest. 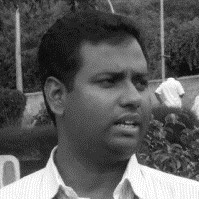 Atanu has been working as a teacher educator from the beginning of his career in Vikramshila. Over time, he has developed different modules of capacity building, and implemented them across a variety of contexts. Developing modules and materials on specific subjects such as Language, Maths and Science are his prime forte. In addition to this role, Atanu oversees a number of projects as program advisor and plays a strong role in organizational capacity building within project teams. A lover of both fiction and non-fiction, he finds Science and Mathematics very intriguing so he loves to engage with teachers and students on these subjects. He strongly believes that education can transform society, by eradicating disparity and discrimination which exists within the same. Vikramshila has given him a platform towards working with his beliefs. Babita has been associated with Vikramshila for over ten years. She has been associated with the development sector prior to that and has a deep understanding of the education system. She is a perfectionist by nature and goes out of her way to ensure precise and exact work. As the academic coordinator, Babita has been responsible for developing and archiving a series of workbooks, TLMs, and modules of teacher trainings and children’s camps – both for language and mathematics. More recently she has been leading the madrasa interventions of Vikramshila since 2011, reaching out to both private and government madrasas, for both academic support and innovations in science and technology. She has also spearheaded the implementation of the unique initiative of the Tata Trusts - ‘Integration of Dinni and Duniyavi Talim’. Babita has worked extensively and passionately with the madrasa system, from the remote madrasas in far flung areas to the department of minority education motivating others and possessing the skill to communicate comfortably at all levels. Babita has also been instrumental in developing the science and maths program reaching out to various schools and madrasas in West Bengal. She enjoys overcoming challenges and has genuine interest in action research. She enjoys listening to music and loves sweets! Jhuma joined Vikramshila in 2006 prior to which she was working in Humanity Association as a teacher. Back then she didn’t know much about what an NGO was and what they did, but found that she was enjoying her work immensely. At Vikramshila she worked in the Reach India project, followed by working intensively with the government madrasas of West Bengal. She also worked in the unique telephone helpline project and the education to employability project which led to work very closely with teachers and schools. Currently she is coordinating the setting up and implementation of supplementary learning centers in Howrah, inside government schools to offer learning support to identified children beyond school hours. Jhuma is a problem solver and a learner who always strives for self development. She likes to listen to music in her free time and is quite fond of cooking! Madhubanti started her career as a television journalist. During her stint with journalism; she had the opportunity to interact with different kinds of people from a cross section of the society that led her to develop a keen interest in socio-political and cultural issues. In the next phase of her career, she taught journalism and mass communication to under graduate students in Kolkata. Over time, her experience and in-depth interactions led her to believe that education alone can lead to social transformation. While deliberating the possibilities of venturing into social development, she joined Vikramshila in 2015. Here she began her career with documentation, communication and teacher development moving on to lead a new intervention of Vikramshila in partnership with Pradan that aims to Transform Rural India (TRI) While frequenting between Bankura, (her project site) and Kolkata, Madhubanti supports the organization’s central resource unit and other project teams in classroom interventions, facilitation of training sessions and audio-visual film making. In her free time, she enjoys, travelling, meeting new people, and is obsessed with cinema! Mustafiz Joined Vikramshila in 2008. A postgraduate in Bangla, Mustafiz began his career with us by undertaking a 6-month project in Tripura on leadership development. After his return to Kolkata, has been involved with several training programs and projects that gave him the opportunity to travel widely in West Bengal and Tripura. 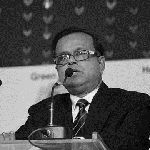 His forte has been training in Bengali language pedagogy, social science and mathematics pedagogy. He has worked with the tribal groups and minority communities in Tripura and West Bengal. He enjoys developing new Teaching Learning Materials in Bengali and is also an exemplary proof reader which is a boon to Vikramshila where content is developed every single day. Mustafiz is currently leading a project in North 24 Parganas and Purulia which aims to offer high quality education to children of marginalized communities in a bid to create child-labour free villages. A very creative person, Mustafiz enjoys writing and travelling to the hills. Namrata started her career in the development sector in 2006. After her post-graduation at the Delhi School of Economics, she joined the Azim Premji Foundation as a program researcher which took her to different parts of the country that gave her exposure to the depth and scope as well as the gaps and challenges of the public education system in India. She has been involved in the Assessment Led Reforms and Computer Aided Learning Programme with the state education departments of Uttarakhand, Karnataka and Rajasthan. She received a comprehensive foundational training from Digantar, Jaipur, which helped her gain a strong theoretical background in education. 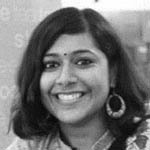 After joining Vikramshila in 2009, she has provided support and technical assistance in program design, knowledge management, development of grants and proposals and creating tools and instruments for monitoring and evaluation. She has been instrumental in the development of a library programme within Vikramshila’s supplementary learning centers for language acquisition, following the principles of early grade reading. Namrata enjoys quiet evenings at home net surfing, reading a variety of genres in fiction and playing with her daughter. She also enjoys watching sitcoms, romcoms, detective and psychological thrillers! She is an extrovert as a person and loves to live in the moment. Being a student of Sociology as well as a travel bug, Vikramshila has given her ample opportunities to nurture her interests. Since past few years she has been mainly associated with early childhood education programme. But as a training team member, she got involved in every level of education system starting from preschool to education to employability. Module development is another major part of her work area for which her research background has helped her a lot. After her post-graduation in Sociology, Ria started her career as a primary teacher in a private school but she grew a natural interest towards the development sector. She is an ardent believer of equality of opportunities and strongly feels that ‘quality education’ should be accessible to all children. She has been an active volunteer assisted in various programs of education, birth control, self sustainability and family assistance. Currently, in Vikramshila, she is leading Vikramshila’s partnership with the U.S. Consulate General; Kolkata to offer career leadership training, using English a tool for empowerment for 35 underserved women who have been survivors of gender based violence. Modules are offered on communicative English, digital literacy, financial literacy and career development, leading to internships. She has worked as a core tea member in the Active Citizenship project which has given her opportunities to work in diverse educational environments – rural schools, urban schools and madrasas as well as learning centers. Because of her keen interest in reading and strong abilities in writing, Ria has been saddled with a number of assignments ranging from social media management, documentation to curriculum development and planning, with special emphasis on English Language teaching. Even though she is a student of Sociology, her interests lie in a wide array of topics ranging from Physics to Economics. She is open to new ideas and new situations, loves interacting with people from diverse backgrounds, enriching herself about their unique cultures. Ria loves baking, reading literature of various genres, writing blogs and listening to music. She is currently learning to play the ukulele. Rita has been working with Vikramshila for more than 23 years which is an amazing experience. She is a repository of the history of Vikramshila and a storehouse of information of the different projects and experiences Vikramshila has garnered over the years. Rita is an active member of the training unit and has worked in a number of unique initiatives including a project on ‘School in Hospitals’. She seamlessly blends into all projects whenever need arises. She loves to travel and interact with people from different communities. Capacity building, teachers training and facilitation, center visits are the major parts of her work, particularly in the area of early childhood education. Working with children gives her an immense pleasure. Being a creative person she loves to create rhymes, short stories for children and interesting TLMs (Teaching Learning Material) which is always a hit in the classrooms and anganwadi centers. She feels that she is learning and evolving everyday through the educational journey of Vikramshila. She defines her job as her passion of life. 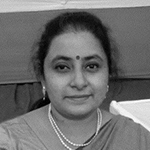 Rita is a trained physiotherapist in addition to being exemplary in art and craft work. She enjoys cooking and has a repertoire of recipes and practical remedies up her bag for all times. Riti joined Vikramshila in 2011, after completing her studies in history and archeology. She started her career in Vikramshila by being a part of a research study on ‘the idea of quality education’ which was undertaken in partnership with TISS. The surveys, interactions and fieldwork intensified her passion for working in the development sector and trying to improve the learning conditions for children in government schools. 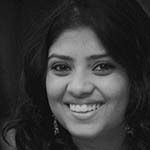 As a member of the organization’s central resource unit, Riti has been an active facilitator in a number of projects. She has developed in unison with her teams, a number of important modules on language, lifeskills and social science. She has been leading the organizations’ active citizenship project which works on curriculum development and attempts to change the pedagogy used in the classroom in teaching of social science. This gave her exposure to a variety of schools, madrasas and learning centers. She has travelled extensively across Bengal and Tripura to support organizational programs on early childhood education, lifeskills and others. Riti loves working with children as well as teachers. She has exemplary mastery over the Bengali language as a result of which she is often the scribe, editor and proof reader for a variety of content generated in Vikramshila. She is, along with Ria our crowned social media manager. Apart from her work she likes reading short stories, novels and poems. She enjoys travelling and exploring different cuisines. Sanchari has been associated with Vikramshila since 2006. During her stint she has worked with multiple projects such as a telephone helpline for teachers, whole school transformation of government madrasas as well as training work. Her love for travelling has connected her to Vikramshila where she had opportunities to travel and impart training. For a certain period of time when she moved out of Calcutta worked as a teacher of English in CBSE schools in different parts of the country- Dehradun, North Bengal, Jabalpur, Bhopal, Dhanbad and Raipur among other places. Alter her return to Calcutta, Sanchari rejoined Vikramshila in 2015. It was as if she had never left. For a brief period she coordinated the education to employability project before moving into her current role, where as a part of the central resource unit, Sanchari is a trainer and facilitator who also develops modules and assessment tools. Sanchari has also been involved with a project on Special Education with IIT KGP. Being a special educator, her interests lie in interacting with different sections of people and to work with children who have learning difficulties. She loves to read books, watch movies and listen to music. 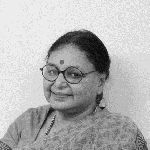 With three decades of experience in community development in the context of planning and monitoring, Satya Gopal joined Vikramshila Education Resource Society as Head – Child Protection and Advocacy. Prior to this he has worked in CRY for more than 25 years in senior management position. His interest areas and strengths are child rights, child protection, child rights legislations, policies, interface and advocacy with government stake holders, statute. A regular participant in the talk-shows and discussions on Child Rights organized in different regional and national TV /Radio, he has also presented several papers in different seminars on Child Rights issues. His hobbies are writing poems and listening to music especially folk and Rabindra sangeet. Soumi joined Vikramshila in 2015. After her education in Political Science from Presidency College and Calcutta University, she pursued M.Phill in Development Studies from Institute of Development Studies in Kolkata. Following which, she has worked as a Guest Lecturer at Muralidhar Girls’ College. Till she joined Vikramshila her knowledge of the social sector was essentially theoretical. It was this organization which helped her to get a practical understanding of the problem. The gaps in her understanding found answers. She is especially interested in research based work and data analysis. The organization helped her to successfully write my dissertation on Conditional Cash Transfer in Education: Understanding KanyashreePrakalpa in West Bengal. She has been trained in analyzing large scale data using softwares such as SPSS and STATA by CSDS, Delhi. Soumi is a part of the central resource unit where she works in the research and documentation team. Developing and maintaining MIS systems, development of recording tools and instruments, undertaking qualitative and quantitative research and documentation are her chief strengths.